White Cedar grows in swampy areas where the trees average diameter is 18”. Although one of the smaller trees, its natural rot resistant characteristic is ideal for both indoor and outdoor products. Fencing, Furniture Components, Shingles, Lattice, Mulch, Garden Accessories, Log Cabin Stock, Tree Stakes and many other products are manufactured out of White Cedar. FLW Wood Products distributes them all. FLW Wood Products understands that to service our customers properly, we must have partnerships with all of our quality mills and maintain year round inventory. Having an office located in Northern Maine allows FLW to visit, on a regular basis, the finest cedar mills in Maine, New Brunswick and Quebec, Canada. In these days of “just in time” service, FLW maintains a wide variety of White Cedar inventory at both the mill level and at our reload centers. Our product mix allows the customer the ability to custom tailor their truckloads with the most varied mix of White Cedar products available anywhere. You have a wide selection of Western Red Cedar fence boards to choose from. There are Clear and Knotty grades with smooth or rough textured surfaces and a range of plain or patterned-top boards. These products meet the quality specifications of published grading rules or the product standards of the Western Red Cedar Lumber Association. The association's standards have been developed to meet consumer's expectations for products of structural integrity and appearance appropriate to the product's end use. If preferred, you can purchase pre-cut patterned fence boards with round, pointed, dog-eared, spearhead or gothic tops; latticework panels; and pre-assembled solid and lattice-work fencing sections. 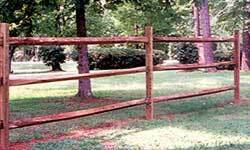 Clear lumber has a limited number of natural characteristics and should be specified when you want fence boards of the highest quality appearance. 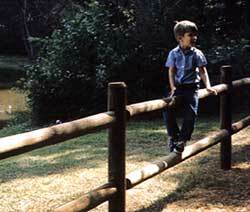 For a more rustic or informal type of fence, knotty lumber is usually preferred. Surfaced Four Sides (S4S) - The smooth surface on all four sides presents a uniformly sized product with a high quality appearance. 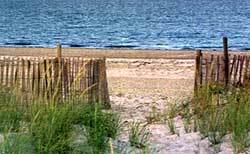 It should be specified when you want an elegant fence with smooth surfaces and construction elements of symmetrical proportions. Surfaced One Side, Two Edges (S1S2E) - This popular product lets you build a fence with either the rough sawn or surfaced face exposed to your view. The surfacing process provides uniform width and thickness tolerances. Rough Sawn/Rougher Headed - The lumber receives its texture from a milling process which uses either circular or band saws or roughened planer knives. The rough texture is clearly visible on all four sides. 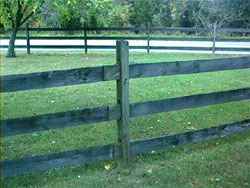 Rough lumber would be your best choice for a rustic style fence. Whereas fence boards are available in a range of thicknesses and widths from many manufacturers, WRCLA members primarily produce 1 inch nominal thicknesses and nominal widths of 2 inches to 8 inches. Popular sizes are summarized in the table below.